This entry was posted on Friday, February 18th, 2011 at 7:26 amand is filed under . You can follow any responses to this entry through the RSS 2.0 feed. You can leave a response, or trackback from your own site. Kelly, what an AMAZING photo! about which i dreamed. thank you, ma’am. 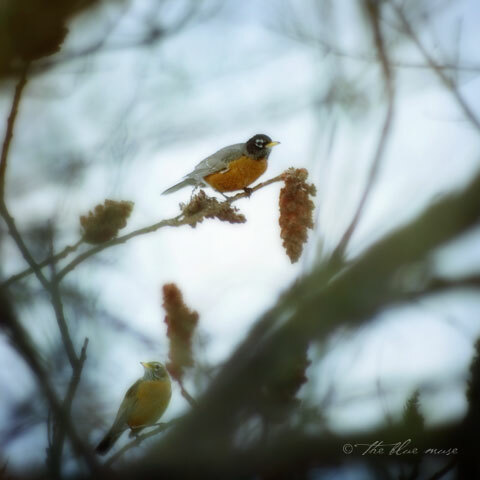 spring is alive……spring is alive……oh lord how i love the robins !!! oh my goodness, they don’t even look real! stunning. i particularly love how precariously the pine cone-looking thing hangs at the end of the branch with the bird seemingly oblivious to its weakness. Spring is almost here! Yeah. ROBIN!!! OH MY GOODNESS!!!! Please let it be so. I feel like we all need spring so badly. After the last few years, we all need something to hope for. This picture is spring brought to life. It is beautiful. I am inspired to take out my camera again.